Jersey lined Vierzon boot by Le Chameau. 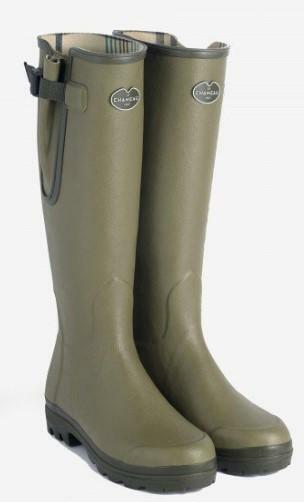 Signature adjustable waterproof gusset with a tightening strap and snap-fastening buckle for secure fit around the calf. Hand-crafted from natural rubber using an aluminium last for a comfortable fit around the leg. Fast-drying jersey lining keeps feet cool and comfortable in temperatures down to 0°C. Using a combination of natural rubber and jersey the boot flexes easily, mirroring any foot movement to reduce fatigue.